"This colorful chili features ground beef, green pepper, onion and beans in a spicy tomato gravy." Cook beef, green pepper, onion, chili powder and black pepper in skillet until browned. Pour off fat. Add tomato juice and beans and heat through. Top with sour cream, green onions, cheese and tomato. This was a great recipe!! My husband thought it was one of the best he had eaten. I did have to add some salt and garlic powder to it. But it was fast and easy and super yummy! 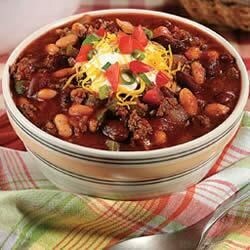 Good basic chili recipe. I did add salt. Used V-8 juice instead on straight tomato juice. This was quick and yummy! I added garlic salt, crushed red peppers and hot sauce because we love super hot chili!! Served w/sour cream, g. onion and cheese in bread bowls. YUM! My picky husband and preschoolers approved. Quick and easy. my husband loved this recipe , but i did add a little bit of hot sauce cause we like a little spice to it .. other than that great chili.